Have you been to some of the big industry conferences and left feeling a bit flat in terms of truly learning how to drive recruitment? Every year, we love to celebrate the great minds that come together to share experience, ideas and insights at our annual International Student Recruitment Bootcamp – especially our faculty! This is a small team focused on sharing best practices in a workshop environment. A rare opportunity. Did you miss our Bootcamp Wrap Up Blog Post last week? Click that link to a post that was shared by your colleagues on social channels with gusto. Share it with your staff executing that global recruitment plan. 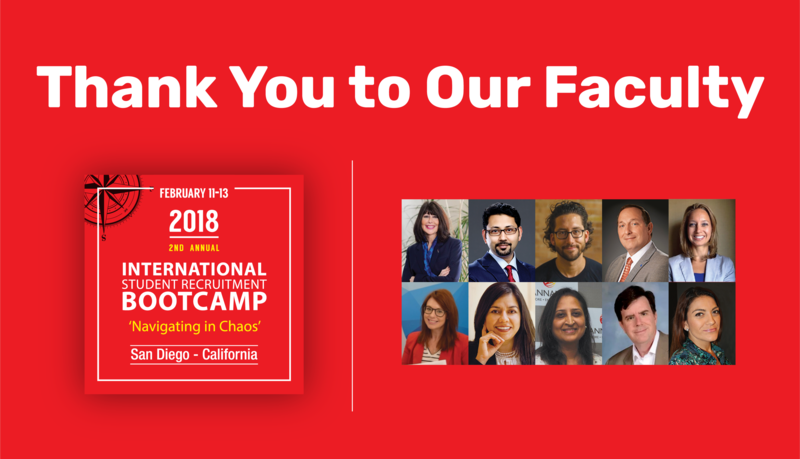 We are so proud to call our Bootcamp faculty friends and to give you the opportunity to learn from their invaluable, tested-in-the-field experience. This event brings hope and a sense of optimism into an industry that is currently flooded with so much turbulence and concern. We are thrilled to say that this year our faculty really did a brilliant job helping our Bootcamp attendees "navigate through chaos." We invite you to read on to learn more about our faculty and the roles they play at their institutions. These are people to keep your eye on in the years ahead – movers and shakers you might say. You can count on us to bring you the talent and perspective to drive your institution forward at all of our presentations and events. Ben will be in Moscow next week presenting at the Forum on International Education about digital marketing techniques to reach the global student market. If you want to stay in the loop for next year's bootcamp, Click Here to be among the first to know about the speakers, dates and more! Dr. Philomena (Philly) Mantella serves as Senior Vice President of Enrollment and Student Life & CEO of the Professional Advancement Network (PAN) at Northeastern University. In this role, Dr. Mantella is responsible for leading the strategic planning, global market expansion, marketing, new business development, digital platforms, learner experience, and academic programs for serving 18,000 adult learners worldwide. In addition, she leads and stewards the development of Northeastern’s global campuses as platforms for all university activity. Dr. Mantella also oversees a broad portfolio at both the undergraduate and graduate levels of enrollment management and student affairs programs in support of the institution’s strong student-centered mission and rising position in the market. Northeastern University has rocketed into the Top 40 of the U.S. News & World Report’s national university rankings during Dr. Mantella’s time at the institution. This top-tier research university is now a global university system with fully operational hubs beyond Boston – in Charlotte, Seattle, Silicon Valley, Toronto, and soon-to-be announced cities in Asia and Europe. At its core, the Northeastern experience is guided by and infused with an experiential approach to education, blurring the lines between work and learning through innovative approaches to industry engagement and new offerings to meet the growing and ever-changing needs of today’s (and the future’s) learners. Dr. Mantella’s background includes broad strategic experience comprised from over 30 years in higher education administration, serving as an officer at many public and private universities throughout New York, New Jersey, and Massachusetts. With the creation of global campuses and PAN, she oversees one of the largest and most diverse division at Northeastern. Dr. Rahul Choudaha is Executive Vice President of Global Engagement, Research & Intelligence at StudyPortals. Founded in 2009 and headquartered in the Netherlands, StudyPortals’ global team of nearly 200 people is advancing international student mobility and making education choice transparent. Operating out of San Francisco Bay Area, Choudaha advances StudyPortals’ strategic engagement with higher education institutions, professional associations, government bodies and related stakeholders on the foundations of research and intelligence. Previously, Choudaha worked for over seven years at World Education Services (WES) in New York City. As Chief Knowledge Officer and Senior Director of Strategic Development, he raised organization profile, built research capabilities, deepened institutional relationships and launched innovative services. Choudaha blogs and tweets as DrEducation. He has presented over 100 sessions at professional conferences and has been quoted in global media including the BBC, Time, NPR and The Wall Street Journal. He received the Tony Adams Award for Excellence from the European Association of International Education in recognition of his research on international student segments. He was also the principal investigator of two national research reports commissioned by NAFSA: Association of International Educators. Choudaha holds a doctorate in higher education administration, master’s in business management, and a bachelor’s in electronics engineering. Sid Krommenhoek is a managing Partner at Peak Ventures, an early stage venture capital firm. Prior, Sid co-founded Zinch.com, a venture-backed online portal connecting students globally with opportunities in higher education. Later, he led Zinch’s growth into China, launching Zinch.cn, one of the first foreign online brands to reach scale in China. When Zinch was acquired by Chegg Inc in 2011, Sid led Chegg’s international efforts through initial public offering in 2013 (CHGG, NYSE). Sid is drawn to tight-knit teams and navigating the chaos that exists in new ventures. As a student-athlete, he was part of the 1998 WAC conference champion basketball team at the University of Utah; Sid later completed his undergraduate degree from Brigham Young University. Pat spent 20 years overseas teaching and managing ESL and international education programs in China, Japan, the UAE and Saudi Arabia. Since returning to the U.S., he worked in the California State University System before becoming a Director at UCLA Extension. Pat recently became Business Development Manager for UCLA Global Online, UCLA’s new initiative to offer graduate degrees and certificates online and in hybrid or transnational formats. Pat has extensive experience recruiting and marketing globally for non-degree programs. In her role, Krista spearheads Sannam S4’s North American strategy. She joins the company from the Cambridge Education Group, where she held the role of Director of University Partnerships. Prior to this, Krista was Director of International Recruitment and Agency Operations at SUNY. She also worked as the North American Regional Manager for the University of Melbourne for three years. Hillary Dostal is Director of Global Marketing, Recruitment and Enrollment Initiative for Northeastern University. After earning a bachelor’s degree in political science from University of Rhode Island Hillary moved to Australia where she began studying mandarin and teaching English. Her teaching brought her to China for a short stint and she fell in love with the idea of global education. Upon returning to the US Hillary started working for Northeastern University in their corporate education office here she gained experience with education technology, education consulting, program development, market analysis and international program development. Some of her clients throughout this time or large multinational corporation like EMC and IBM. Hillary completed her MBA while working at Northeastern University and subsequently has in rolled in a doctorates degree which she is working towards. Hillary‘s work experience and studies has made her quite fond of Northeastern University and her morals align with its mission helping young students become a more sophisticated professional through experiential learning. Rosie leads the International Admissions Office in its efforts to recruit and retain international students. In her previous role with EducationUSA, she developed innovative recruitment opportunities for the US higher education institutions such as the first EducationUSA LLM Fair Tour. As a social media enthusiast, she created the first EducationUSA LGBT Virtual Fair and other digital programming. Rosie has worked in the field of international admissions and recruitment for more than 16 years and presented extensively on low cost recruitment strategies. Rosie previously served as the Co-Chair of the Japan MIG; this year she joins the Trainer Corps and will return as a mentor in the 2017 Diversity Impact Program. Lakshmi has been an active observer and commentator within the education industry for over 15 years and brings a great deal of passion and a senior managerial experience to the table. Lakshmi has been with Sannam S4 since 2011. Under her leadership, the Education Division now supports over 50 Higher Ed clients from 9 countries and contributes over 50% of the revenue base of the company. In the last four years, Lakshmi has been responsible for nurturing key relationships, which has enabled the Division to expand its footprint to China and South East Asia apart from India, Brazil and the UAE. establishment team in Mumbai and eventually relocating to New Delhi to run the operations at the Head Quarters. In her 17 month tenure as Head of UK operations, Lakshmi established new branches in Indore and Chandigarh, while managing six offices across the country. Through Dr. Merges’ work with the United Nations, Rutgers Preparatory School became the first high school in the world affiliated as an NGO with the United Nations through the Department of Public Information (UNDPI). He currently serves as the Treasurer of Study New Jersey and the K-12 Representative for NAFSA Region X (New Jersey and New York) with a focus on connecting international students in K-12 with higher education admissions officers. Dr. Merges has presented at conferences around the United States; as well as Canada, China, Jamaica, and Turkey, on the topic of communication through online environments. Zehra Angel Ahmed has 15 years of experience in international marketing, recruitment, and business development. She has worked in executive leadership roles at prestigious global companies and institutions, and has internationalized several universities, establishing their brands in markets around the world. In addition, she increased their international student populations by over 400%, whilst developing several successful global partnerships. Leveraging her existing network of industry connections and education partners Ms. Ahmed currently consults in the area of international marketing, recruitment, and business development for institutions in the Americas, Europe, Middle East, and Asia. She specializes in the development and execution of internationalization strategies: student recruitment, marketing, admissions/ enrollment structuring, strategic partnerships, business development, and international leadership.